"NHL" redirects here. For other uses, see NHL (disambiguation). The National Hockey League was organized on November 26, 1917, at the Windsor Hotel in Montreal after the suspension of operations of its predecessor organization, the National Hockey Association (NHA), which had been founded in 1909 in Renfrew, Ontario. The NHL immediately took the NHA's place as one of the leagues that contested for the Stanley Cup in an annual interleague competition before a series of league mergers and folds left the NHL as the only league left competing for the Stanley Cup in 1926. At its inception, the NHL had four teams—all in Canada, thus the adjective "National" in the league's name. The league expanded to the United States in 1924, when the Boston Bruins joined, and has since consisted of American and Canadian teams. From 1942 to 1967, the league had only six teams, collectively (if not contemporaneously) nicknamed the "Original Six". The NHL added six new teams to double its size at the 1967 NHL expansion. The league then increased to 18 teams by 1974 and 21 teams in 1979. Between 1991 and 2000, the NHL further expanded to 30 teams. It added its 31st team in 2017 and has approved the addition of a 32nd team in 2021. The league's headquarters have been in New York City since 1989 when the head office moved there from Montreal. The International Ice Hockey Federation (IIHF) considers the Stanley Cup to be one of the "most important championships available to the sport". The NHL draws many highly skilled players from all over the world and currently has players from approximately 20 countries. Canadians have historically constituted the majority of the players in the league, with an increasing percentage of American and European players in recent seasons. The National Hockey League was established in 1917 as the successor to the National Hockey Association (NHA). Founded in 1909, the NHA began play one year later with seven teams in Ontario and Quebec, and was one of the first major leagues in professional ice hockey. But by the NHA's eighth season, a series of disputes with Toronto Blueshirts owner Eddie Livingstone led team owners of the Montreal Canadiens, Montreal Wanderers, Ottawa Senators, and Quebec Bulldogs to hold a meeting to discuss the league's future. Realizing the NHA constitution left them unable to force Livingstone out, the four teams voted instead to suspend the NHA, and on November 26, 1917, formed the National Hockey League. Frank Calder was chosen as its first president, serving until his death in 1943. The NHL replaced the NHA as one of the leagues that competed for the Stanley Cup, which was an interleague competition back then. Toronto won the first NHL title, and then defeated the Vancouver Millionaires of the Pacific Coast Hockey Association (PCHA) for the 1918 Stanley Cup. The Canadiens won the league title in 1919; however their Stanley Cup Final against the PCHA's Seattle Metropolitans was abandoned as a result of the Spanish Flu epidemic. Montreal in 1924 won their first Stanley Cup as a member of the NHL. The Hamilton Tigers, won the regular season title in 1924–25 but refused to play in the championship series unless they were given a C$200 bonus. The league refused and declared the Canadiens the league champion after they defeated the Toronto St. Patricks (formerly the Arenas) in the semi-final. Montreal was then defeated by the Victoria Cougars of the Western Canada Hockey League (WCHL) for the 1925 Stanley Cup. It was the last time a non-NHL team won the trophy, as the Stanley Cup became the de facto NHL championship in 1926 after the WCHL ceased operation. The National Hockey League embarked on rapid expansion in the 1920s, adding the Montreal Maroons and Boston Bruins in 1924. The Bruins were the first American team in the league. The New York Americans began play in 1925 after purchasing the assets of the Hamilton Tigers, and were joined by the Pittsburgh Pirates. The New York Rangers were added in 1926. The Chicago Black Hawks and Detroit Cougars (later Red Wings) were also added after the league purchased the assets of the defunct WCHL. A group purchased the Toronto St. Patricks in 1927 and immediately renamed them the Maple Leafs. The first NHL All-Star Game was held in 1934 to benefit Ace Bailey, whose career ended on a vicious hit by Eddie Shore. The second was held in 1937 in support of Howie Morenz's family when he died of a coronary embolism after breaking his leg during a game. Maurice "Rocket" Richard became the first player to score 50 goals, doing so in a 50-game season. Richard later led the Canadiens to five consecutive titles between 1956 and 1960, a record no team has matched. Willie O'Ree broke the league's colour barrier on January 18, 1958 when he made his debut with the Boston Bruins and became the first black player in league history. By the mid-1960s, the desire for a network television contract in the U.S., and concerns that the Western Hockey League was planning to declare itself a major league and challenge for the Stanley Cup, spurred the league to undertake its first expansion since the 1920s. The league doubled in size for the 1967–68 season, adding the Los Angeles Kings, Minnesota North Stars, Philadelphia Flyers, Pittsburgh Penguins, California Seals and St. Louis Blues. Canadian fans were outraged that all six teams were placed in the United States, and the league responded by adding the Vancouver Canucks in 1970 along with the Buffalo Sabres, who are located on the Canada–US border. Two years later, the emergence of the newly founded World Hockey Association (WHA) led the league to add the New York Islanders and Atlanta Flames to keep the rival league out of those markets. In 1974, the Washington Capitals and Kansas City Scouts were added, bringing the league up to 18 teams. The National Hockey League fought the WHA for players, losing 67 to the new league in its first season of 1972–73, including Bobby Hull, who signed a ten-year, $2.5 million contract with the Winnipeg Jets, the largest in hockey history at the time. The league attempted to block the defections in court, but a counter-suit by the WHA led to a Philadelphia judge ruling the NHL's reserve clause to be illegal, thus eliminating the elder league's monopoly over the players. Seven years of battling for players and markets financially damaged both leagues, leading to a 1979 merger agreement that saw the WHA cease operations while the NHL absorbed the Winnipeg Jets, Edmonton Oilers, Hartford Whalers and Quebec Nordiques. The owners initially rejected this merger agreement by one vote, but a massive boycott of Molson Brewery products by fans in Canada caused the Montreal Canadiens, which was owned by Molson, to reverse its position, along with the Vancouver Canucks. In a second vote the plan was approved. Wayne Gretzky played one season in the WHA for the Indianapolis Racers (eight games) and the Edmonton Oilers (72 games) before the Oilers joined the National Hockey League for the 1979–80 season. Gretzky went on to lead the Oilers to four Stanley Cup championships in 1984, 1985, 1987 and 1988, and set single season records for goals (92 in 1981–82), assists (163 in 1985–86) and points (215 in 1985–86), as well as career records for goals (894), assists (1,963) and points (2,857). He was traded to the Kings in 1988, a deal that dramatically improved the league's popularity in the United States, and provided the impetus for the 1990s expansion cycles that saw the addition of nine teams: the San Jose Sharks, Tampa Bay Lightning, Ottawa Senators, Mighty Ducks of Anaheim, Florida Panthers, Nashville Predators, Atlanta Thrashers (now Winnipeg Jets), and in 2000 the Minnesota Wild and Columbus Blue Jackets. On July 21, 2015, the NHL confirmed that it had received applications from prospective ownership groups in Quebec City and Las Vegas for possible expansion teams, and on June 22, 2016, NHL Commissioner Gary Bettman announced the addition of a 31st franchise, based in Las Vegas and later named the Vegas Golden Knights, into the NHL for the 2017–18 season. On December 4, 2018, the league announced a 32nd franchise in Seattle to begin play in the 2021–22 season. There have been four league-wide work stoppages in league history, all happening since 1992. The first was a strike by the National Hockey League Players' Association in April 1992 which lasted for ten days, but the strike was settled quickly and all affected games were rescheduled. A lockout at the start of the 1994–95 season forced the league to reduce the schedule from 84 games to just 48, with the teams playing only intra-conference games during the reduced season. The resulting collective bargaining agreement (CBA) was set for renegotiation in 1998 and extended to September 15, 2004. With no new agreement in hand when the contract expired on September 15, 2004, league commissioner Gary Bettman announced a lockout of the players union and closed the league's head office. The league vowed to install what it dubbed "cost certainty" for its teams, but the Players' Association countered that the move was little more than a euphemism for a salary cap, which the union initially said it would not accept. The lockout shut down the league for 310 days, the longest in sports history, as the NHL became the first professional sports league to lose an entire season. A new collective bargaining agreement was eventually ratified in July 2005, including a salary cap. The agreement had a term of six years with an option of extending the collective bargaining agreement for an additional year at the end of the term, allowing the league to resume as of the 2005–06 season. On October 5, 2005, the first post-lockout season took to the ice with all 30 teams. The NHL received record attendance in the 2005–06 season: an average of 16,955 per game. The League's TV audience was slower to rebound because of American cable broadcaster ESPN's decision to drop the sport. The league's post-lockout agreement with NBC gave the league a share of revenue from each game's advertising sales, rather than the usual lump sum paid up front for game rights. The league's annual revenues were estimated at approximately $2.27 billion. At midnight September 16, 2012, the labour pact expired, and the league again locked out the players. The owners proposed reducing the players' share of hockey-related revenues from 57 percent to 47 percent. All games were cancelled up to January 14, 2013, as well as the 2013 NHL Winter Classic and the 2013 NHL All-Star Weekend. A tentative agreement was reached on January 6, 2013, on a ten-year deal. On January 12, the league and the Players' Association signed a memorandum of understanding on the new deal, allowing teams to begin their training camps on January 13, with a shortened 48-game season schedule that began on January 19. Player safety has become a major issue and concussions, which result from a hard hit to the head, have been the biggest cause. With recent studies showing how concussions can affect retired players and how it has decreased their quality of life after retirement, concussions have become a very important topic of debate when it comes to player safety issues. This had significant effects on the league as elite players were being taken out of the game, such as Sidney Crosby being sidelined for approximately 10 and a half months, which adversely affected the league's marketability. As a result, in December 2009, Brendan Shanahan was hired to replace Colin Campbell and given the role of senior vice-president of player safety. Shanahan began to hand out suspensions on high-profile perpetrators responsible for dangerous hits, such as Raffi Torres receiving 25 games for his hit on Marian Hossa. To aid with removing high speed collisions on icing, which had led to several potential career-ending injuries such as Hurricanes' defenceman Joni Pitkanen, the league mandated hybrid no-touch icing for the 2013–14 NHL season. On November 25, 2013, ten former players (Gary Leeman, Rick Vaive, Brad Aitken, Darren Banks, Curt Bennett, Richie Dunn, Warren Holmes, Bob Manno, Blair Stewart and Morris Titanic) sued the league for negligence on protecting players from concussions. The suit came three months after the National Football League agreed to pay former players US$765 million due to a player safety lawsuit. From 1952 to 1955, Marguerite Norris served as president of the Detroit Red Wings, the first woman NHL executive and the first woman to have her name engraved on the Stanley Cup. In 1992, Manon Rheaume became the first woman to play a game in any of the major professional North American sports leagues, as a goaltender for the Tampa Bay Lightning in an NHL pre-season game against the St. Louis Blues, stopping seven of nine shots. In 2016, Dawn Braid was hired as the Arizona Coyotes' skating coach, making her the first female full-time coach in the NHL. The Board of Governors meets twice per year, in the months of June and December, with the exact date and place to be fixed by the Commissioner. The NHL consists of 31 teams, 24 of which are based in the United States and seven in Canada. The NHL divides the 31 teams into two conferences: the Eastern Conference and the Western Conference. Each conference is split into two divisions: the Eastern Conference contains 16 teams (eight per division), while the Western Conference has 15 teams (seven in the Central Division and eight in the Pacific Division). The current alignment has existed since the 2017–18 season. The number of NHL teams held constant at 30 teams from the 2000–01 season when the Minnesota Wild and the Columbus Blue Jackets joined the league as expansion teams, until 2017. That expansion capped a period in the 1990s of rapid expansion and relocation when the NHL added 9 teams to grow from 21 to 30 teams, and relocated four teams mostly from smaller northern cities (e.g., Hartford, Quebec) to larger warmer metropolitan areas (e.g., Dallas, Phoenix). The league has not contracted any teams since the Cleveland Barons folded in 1978. The league expanded for the first time in 17 years to 31 teams in 2017 with the addition of the Vegas Golden Knights and then approved a 32nd team in Seattle that will begin playing in the 2021–22 season. According to Forbes, in 2018, all five of the most valuable teams were "Original Six" teams: the New York Rangers at approximately $1.55 billion, the Toronto Maple Leafs at $1.45 billion, the Montreal Canadiens at $1.3 billion, the Chicago Blackhawks at $1.05 billion, and the Boston Bruins at $925 million. At least eight NHL clubs operate at a loss. NHL teams are susceptible to the Canadian–U.S. exchange rate: revenue from tickets, local and national advertising in Canada, and local and national Canadian media rights are collected in Canadian dollars, but all players' salaries are paid in U.S. dollars regardless of whether a team is located in Canada or the U.S. The Edmonton Oilers, Hartford Whalers (now Carolina Hurricanes), Quebec Nordiques (now Colorado Avalanche), and original Winnipeg Jets (now Arizona Coyotes) all joined the NHL in 1979 as part of the NHL–WHA merger. Each National Hockey League regulation game is 60 minutes long. The game is composed of three 20-minute periods with an intermission between periods. At the end of regulation time, the team with the most goals wins the game. If a game is tied after regulation time, overtime ensues. During the regular season, overtime is a five-minute, three-on-three sudden-death period, in which whoever scores a goal first will win the game. If the game is still tied at the end of overtime, the game enters a shootout. Three players for each team in turn take a penalty shot. The team with the most goals during the three-round shootout wins the game. If the game is still tied after the three shootout rounds, the shootout continues but becomes sudden-death. Whichever team ultimately wins the shootout is awarded a goal in the game score and thus awarded two points in the standings. The losing team in overtime or shootout is awarded only one. Shootout goals and saves are not tracked in hockey statistics; shootout statistics are tracked separately. There are no shootouts during the playoffs. Instead, multiple sudden-death, 20-minute five-on-five periods are played until one team scores. Two games have reached six overtime periods, but none have gone beyond six. During playoff overtime periods, the only break is to clean the loose ice at the first stoppage after the period is halfway finished. National Hockey League games are played on a rectangular hockey rink with rounded corners surrounded by walls and Plexiglas. It measures 200 feet (60.96 m) by 85 feet (25.91 m) in the NHL, approximately the same length but much narrower than International Ice Hockey Federation standards. The centre line divides the ice in half, and is used to judge icing violations. There are two blue lines that divide the rink roughly into thirds, delineating one neutral and two attacking zones. Near the end of both ends of the rink, there is a thin red goal line spanning the width of the ice, which is used to judge goals and icing calls. A trapezoidal area behind each goal net has been introduced. The goaltender can play the puck only within the trapezoid or in front of the goal line; if the goaltender plays the puck behind the goal line and outside the trapezoidal area, a two-minute minor penalty for delay of game is assessed. The rule is unofficially nicknamed the "Martin Brodeur rule". Since the 2013–14 season, the league trimmed the goal frames by 4 inches (10 cm) on each side and reduced the size of the goalies' leg pads. The National Hockey League's rules are one of the two standard sets of professional ice hockey rules in the world. The rules themselves have evolved directly from the first organized indoor ice hockey game in Montreal in 1875, updated by subsequent leagues up to 1917, when the NHL adopted the existing NHA set of rules. The NHL's rules are the basis for rules governing most professional and major junior ice hockey leagues in North America. Infractions of the rules, such as offside and icing, lead to a stoppage of play and subsequent face-offs, while more serious infractions leading to penalties to the offending teams. The league also determines the specifications for playing equipment used in its games. The league has regularly modified its rules to counter perceived imperfections in the game. The penalty shot was adopted from the Pacific Coast Hockey Association to ensure players were not being blocked from opportunities to score. For the 2005–06 season, the league changed some of the rules regarding being offside. First, the league removed the "offside pass" or "two-line pass" rule, which required a stoppage in play if a pass originating from inside a team's defending zone was completed on the offensive side of the centre line, unless the puck crossed the line before the player. Furthermore, the league reinstated the "tag-up offside" which allows an attacking player a chance to get back onside by returning to the neutral zone. The changes to the offside rule were among several rule changes intended to increase overall scoring, which had been in decline since the expansion years of the mid-nineties and the increased prevalence of the neutral zone trap. Since 2005, when a team is guilty of icing the puck they are not allowed to make a line change or skater substitution of any sort before the following face-off (except to replace an injured player or re-install a pulled goaltender). Since 2013, the league has used hybrid icing, where a linesman stops play due to icing if a defending player (other than the goaltender) crosses the imaginary line that connects the two face-off dots in their defensive zone before an attacking player is able to. This was done to counter a trend of player injury in races to the puck. The league's rules differ from the rules of the International Ice Hockey Federation (IIHF), as used in tournaments such as the Olympics, which were themselves derived from the Canadian amateur ice hockey rules of the early 20th century. In the NHL, fighting leads to major penalties while IIHF rules, and most amateur rules, call for the ejection of fighting players. Usually, a penalized team cannot replace a player that is penalized on the ice and is thus short-handed for the duration of the penalty, but if the penalties are coincidental, for example when two players fight, both teams remain at full strength. Also, unlike minor penalties, major penalties must be served to their full completion, regardless of number of goals scored during the power play. The NHL and IIHF differ also in playing rules, such as icing, the areas of play for goaltenders, helmet rules, officiating rules, timeouts and play reviews. The league also imposes a conduct policy on its players. Players are banned from gambling and criminal activities have led to the suspension of players. The league and the Players' Association agreed to a stringent anti-doping policy in the 2005 bargaining agreement. The policy provides for a twenty-game suspension for a first positive test, a sixty-game suspension for a second positive test, and a lifetime suspension for a third positive test. The National Hockey League season is divided into a regular season (from early October through early to mid April) and a postseason (the Stanley Cup playoffs). During the regular season, clubs play each other in a predefined schedule. In the regular season, each team plays 82 games: 41 games each of home and road. Eastern teams play 28 games in their own geographic division—four against each of their seven other divisional opponents—and 24 games against the eight remaining non-divisional intra-conference opponents—three games against every team in the other division of its conference. Western teams play 26 or 29 games in their own geographic division—four or five against each of their six or seven other divisional opponents—and 21 or 24 games against the six or seven remaining non-divisional intra-conference opponents—three games against every team in the other division of its conference, with one cross-division intra-conference match-up occurring in four games. All teams play every team in the other conference twice—home and road. The league's regular season standings are based on a point system. Two points are awarded for a win, one point for losing in overtime or a shootout, and zero points for a loss in regulation. At the end of the regular season, the team that finishes with the most points in each division is crowned the division champion, and the league's overall leader is awarded the Presidents' Trophy. The Stanley Cup playoffs, which go from April to the beginning of June, is an elimination tournament where two teams play against each other to win a best-of-seven series in order to advance to the next round. The final remaining team is crowned the Stanley Cup champion. Eight teams from each conference qualify for the playoffs: the top three teams in each division plus the two conference teams with the next highest number of points. The two conference champions proceed to the Stanley Cup Final. In all rounds, the higher-ranked team is awarded home-ice advantage, with four of the seven games played at this team's home venue. In the Stanley Cup Final, the team with the most points during the regular season has home-ice advantage. The annual NHL Entry Draft consists of a seven-round off-season draft held in late June. Early NHL drafts took place at the Queen Elizabeth (currently Fairmont) Hotel in Montreal. Amateur players from junior, collegiate, or European leagues are eligible to enter the Entry Draft. The selection order is determined by a combination of the standings at the end of the regular season, playoff results, and a draft lottery. The 15 teams that did not qualify for the playoffs are entered in a weighted lottery to determine the initial draft picks in the first round, with the last place team having the best chance of winning the lottery. Once the lottery determines the initial draft picks, the order for the remaining non-playoff teams is determined by the standings at the end of the regular season. For those teams that did qualify for the playoffs, the draft order is then determined by total regular season points for non-division winners that are eliminated in the first two rounds of the playoffs, then any division winners that failed to reach the Conference Finals. Conference finalists receive the 28th and 29th picks depending on total points, with the Stanley Cup runner-up given the 30th pick and the Stanley Cup champions the 31st pick. * Includes one pre-NHL championship. The most prestigious team award is the Stanley Cup, which is awarded to the league champion at the end of the Stanley Cup playoffs. The team that has the most points in the regular season is awarded the Presidents' Trophy. The Montreal Canadiens are the most successful franchise in the league. Since the formation of the league in 1917, they have 25 NHL championships (three between 1917 and 1925 when the Stanley Cup was still contested in an interleague competition, twenty-two since 1926 after the Stanley Cup became the NHL's championship trophy). They also lead all teams with 24 Stanley Cup championships (one as an NHA team, twenty-three as an NHL team). Of the four major professional sports leagues in North America, the Montreal Canadiens are surpassed in the number of championships only by the New York Yankees of Major League Baseball, who have three more. The longest streak of winning the Stanley Cup in consecutive years is five, held by the Montreal Canadiens from 1955–56 to 1959–60. The 1977 edition of the Montreal Canadiens, the second of four straight Stanley Cup champions, was named by ESPN as the second greatest sports team of all-time. The next most successful NHL franchise is the Toronto Maple Leafs with 13 Stanley Cup championships, most recently in 1967. The Detroit Red Wings, with 11 Stanley Cup championships, are the most successful American franchise. The same trophy is reused every year for each of its awards. The Stanley Cup, much like its CFL counterpart, is unique in this aspect, as opposed to the Vince Lombardi Trophy, Larry O'Brien Trophy, and Commissioner's Trophy, which have new ones made every year for that year's champion. Despite only one trophy being used, the names of the teams winning and the players are engraved every year on the Stanley Cup. The same can also be said for the other trophies reissued every year. There are numerous trophies that are awarded to players based on their statistics during the regular season; they include, among others, the Art Ross Trophy for the league scoring champion (goals and assists), the Maurice "Rocket" Richard Trophy for the goal-scoring leader, and the William M. Jennings Trophy for the goaltender(s) for the team with the fewest goals against them. The other player trophies are voted on by the Professional Hockey Writers' Association or the team general managers. These individual awards are presented at a formal ceremony held in late June after the playoffs have concluded. The most prestigious individual award is the Hart Memorial Trophy which is awarded annually to the Most Valuable Player; the voting is conducted by members of the Professional Hockey Writers Association to judge the player who is the most valuable to his team during the regular season. The Vezina Trophy is awarded annually to the person deemed the best goaltender as voted on by the general managers of the teams in the NHL. The James Norris Memorial Trophy is awarded annually to the National Hockey League's top defenceman, the Calder Memorial Trophy is awarded annually to the top rookie, and the Lady Byng Memorial Trophy is awarded to the player deemed to combine the highest degree of skill and sportsmanship; all three of these awards are voted on by members of the Professional Hockey Writers Association. In addition to the regular season awards, the Conn Smythe Trophy is awarded annually to the most valuable player during the NHL's Stanley Cup playoffs. Furthermore, the top coach in the league wins the Jack Adams Award as selected by a poll of the National Hockey League Broadcasters Association. The National Hockey League publishes the names of the top three vote getters for all awards, and then names the award winner during the NHL Awards Ceremony. Players, coaches, officials, and team builders who have had notable careers are eligible to be voted into the Hockey Hall of Fame. Players cannot enter until three years have passed since their last professional game, currently tied with the Naismith Memorial Basketball Hall of Fame for the shortest such time period of any major sport. One unique consequence has been Hall of Fame members (specifically, Gordie Howe, Guy Lafleur, and Mario Lemieux) coming out of retirement to play once more. If a player was deemed significant enough, the three-year wait would be waived; only ten individuals have been honoured in this manner. 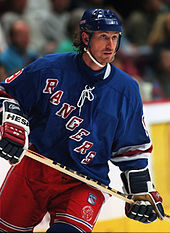 In 1999, Wayne Gretzky joined the Hall and became the last player to have the three-year restriction waived. After his induction, the Hall of Fame announced that Gretzky would be the last to have the waiting period waived. In addition to Canadian and American born and trained players, who have historically composed a large majority of NHL rosters, the NHL also draws players from an expanding pool of other nations where organized and professional hockey is played. Since the collapse of the Soviet Bloc, political/ideological restrictions on the movement of hockey players from this region have disappeared, leading to a large influx of players mostly from Czech Republic, Slovakia and Russia into the NHL. Swedes, Finns, and other Western Europeans, who were always free to move to North America, came to the league in greater numbers than before. Many of the league's top players in recent years have come from these European countries including Daniel Alfredsson, Erik Karlsson, Henrik Sedin, Daniel Sedin, Henrik Lundqvist, Jaromir Jagr, Patrik Elias, Zdeno Chara, Pavel Datsyuk, Evgeni Malkin, Nicklas Lidstrom and Alexander Ovechkin. European players were drafted and signed by NHL teams in an effort to bring in more "skilled offensive players", although recently[when?] there has been a decline in European players as more American players enter the league. The addition of European players changed the style of play in the NHL and European style hockey has been integrated into the NHL game. As of the 2017–18 season, the NHL has players from 17 different countries, with 46.0% coming from Canada and 26.0% from the United States, players from a further 15 countries make up 26.4% of NHL rosters. The following table shows the six countries make up the vast majority of NHL players. The table follows the Hockey Hall of Fame convention of classifying players by the currently existing countries in which their birthplaces are located, without regard to their citizenship or where they were trained. The NHL lists its several official corporate partners into three categories: North American Partners, USA Partners, and Canada Partners. Discover Card is the league's official credit card in the US, while competitor Visa is an official sponsor in Canada. Likewise, Tim Hortons is the league's official coffee and doughnuts chain in Canada, while Dunkin' Donuts is the NHL's sponsor in the US. Among its North American corporate sponsors, Kraft Heinz sponsors Kraft Hockeyville, an annual competition in which communities compete to demonstrate their commitment to the sport of ice hockey. The winning community gets a cash prize dedicated to upgrading their local home arena, as well as the opportunity to host an NHL pre-season game. Two contests are held, one for communities across Canada and a separate competition for communities in the US. At least two of the North American corporate sponsors have ties to NHL franchise owners: the Molson family, founders of Molson Brewery, has owned the Montreal Canadiens for years, while SAP was co-founded by Hasso Plattner, the current majority owner of the San Jose Sharks. Many of these same corporate partners become the title sponsors for the league's All-Star and outdoor games. Broadcasting rights in Canada have historically included the CBC's Hockey Night in Canada (HNIC), a Canadian tradition dating to 1952, and even prior to that on radio since the 1920s. The current national television and digital rightsholder is Rogers Communications, under a 12-year deal valued at C$5.2 billion which began in the 2014–15 season, as the national broadcast and cable television rightsholders. National English-language coverage of the NHL is carried primarily by Rogers' Sportsnet group of specialty channels; Sportsnet holds national windows on Wednesday and Sunday nights. Hockey Night in Canada was maintained and expanded under the deal, airing up to seven games nationally on Saturday nights throughout the regular season. CBC maintains Rogers-produced NHL coverage during the regular season and playoffs. Sportsnet's networks also air occasional games involving all-U.S. matchups. Quebecor Media holds national French-language rights to the NHL, with all coverage airing on its specialty channel TVA Sports. Games that are not broadcast as part of the national rights deal are broadcast by Sportsnet's regional feeds, TSN's regional feeds, and RDS. Regional games are subject to blackout for viewers outside of each team's designated market. Historically, the NHL has never fared well on American television in comparison to the other American professional leagues. The league's American broadcast partners have been in flux for decades, ranging from such networks as CBS, SportsChannel America, the USA Network, Fox, ABC, and ESPN. National U.S. television rights are currently held by NBC Sports; its current 10-year, US$2 billion contract, which began in the 2011–12 season, extended and unified rights deals that were first established in the 2005–06 season, when Comcast acquired cable rights to replace ESPN, and NBC acquired broadcast television rights under a revenue-sharing agreement to replace ABC. NBC Sports Network and the company negotiated a new, 10-year, unified rights deal worth nearly US$2 billion. Under this contract, NBCSN usually airs at least two regular season games per week, while NBC airs afternoon games on selected weekends. NBCUniversal holds exclusive rights to Wednesday night games, all games televised by the NBC network, and every game in the Stanley Cup playoffs beginning in the second round. Coverage of the playoffs and the Finals is split between the two networks, with other games shown on CNBC, USA Network, NHL Network. As in Canada, games not broadcast nationally are aired regionally within a team's home market, and are subject to blackout outside of them. These broadcasters include regional sports network chains. Certain national telecasts on NBCSN are non-exclusive, and may also air in tandem with telecasts of the game by local broadcasters. However, national telecasts of these games are blacked out in the participating teams' markets to protect the local broadcaster. The league co-owns the NHL Network, a television specialty channel devoted to the NHL. Its signature show is NHL Tonight. The NHL Network also airs live games, but primarily simulcasts of one of the team's regional broadcasters. The U.S. version simulcasts selected regular season games nationally that are not aired by NBC Sports, as well as be used as an overflow channel during the playoffs. The NHL operates two subscription-based services allowing access to live, out-of-market games. NHL Centre Ice in Canada and NHL Center Ice in the United States offer access to out-of-market feeds of games through a cable or satellite television provider. The league also offers NHL.tv (branded as Rogers NHL GameCentre Live in Canada), which allows the streaming of out-of-market games over the internet and is coordinated by MLB Advanced Media as of February 2016. In the United States, NHL.tv does not carry national games or in-market games. Outside of Canada and the United States, NHL games are broadcast across Europe, in the Middle East, in Australia, and in the Americas across Mexico, Central America, Dominican Republic, Caribbean, South America and Brazil, among others. NHL.tv is also available for people outside Canada and the United States to watch games online. The National Hockey League has occasionally participated in international club competitions. Most of these competitions were arranged by the NHL or NHLPA. The first international club competition was held in 1976, with eight NHL teams playing against the Soviet Championship League's HC CSKA Moscow, and Krylya Sovetov Moscow. Between 1976 and 1991, the NHL, and the Soviet Championship League would hold a number of exhibition games between the two leagues known as the Super Series. No NHL club had played a Russian-based club from the end of the Super Series in 1991 to 2008, when the New York Rangers faced Metallurg Magnitogorsk in the 2008 Victoria Cup. In addition to the Russian clubs, NHL clubs had participated in a number of international club exhibitions and competitions with various European-based clubs. The first exhibition game to feature an NHL team against a European-based team (aside from clubs based in the former Soviet Union) was in December 1977, when the New York Rangers faced Poldi Kladno of the Czechoslovak First Ice Hockey League. In the 2000s the NHL had organized four NHL Challenge series between NHL, and European clubs. From 2007 to 2011, the NHL organized exhibition games prior to the beginning of the season, known as the NHL Premiere, between NHL clubs and teams from a number of European leagues. The 2018 NHL Global Series was the last NHL-organized club competition involving European teams. NHL clubs have also participated in IIHF-organized club tournaments. The most recent IIHF-organized event including an NHL club was the 2009 Victoria Cup, between the Swiss National League A's ZSC Lions, and the Chicago Blackhawks. From 1998 to 2014, during the quadrennial Winter Olympic years, the NHL suspended its all-star game and expanded the traditional all-star break to allow NHL players to represent their countries in the Olympic ice hockey tournament; starting 2018, because the All-Star game is held in late January, there would be no Olympic break. Conversely, the annual Ice Hockey World Championships are held every May at the same time as the Stanley Cup playoffs. Thus, NHL players generally only join their respective country's team in the World Championships if their respective NHL team has been eliminated from Stanley Cup contention, or did not make the playoffs. In 2007, the International Ice Hockey Federation (IIHF) formalized the "Triple Gold Club", the group of players and coaches who have won an Olympic gold medal, a World Championship gold medal, and the Stanley Cup. The term had first entered popular use following the 2002 Winter Olympics, which saw the addition of the first Canadian members. As well as participating in the above international club competitions, the NHL and the National Hockey League Players' Association organizes the World Cup of Hockey. Unlike the Ice Hockey World Championships and the Olympic tournament, both run by the International Ice Hockey Federation, the World Cup of Hockey is played under NHL-rules and not those of the IIHF. The tournament takes place prior to the NHL pre-season. The event is planned to be a quadrennial event beginning in 2016. The NHL is considered one of the four major professional sports leagues in North America, along with Major League Baseball, the National Football League, and the National Basketball Association. The league is very prominent in Canada, where hockey is the most popular of these four major sports as alongside CFL. Overall, hockey has the smallest total fan base of the four leagues, the smallest revenue from television, and the least sponsorship. The NHL holds one of the most affluent fan bases. Studies by the Sports Marketing Group conducted from 1998 to 2004 show that the NHL's fan base is much more affluent than that of the PGA Tour. [not in citation given] A study done by the Stanford Graduate School of Business in 2004, found that NHL fans in America were the most educated and affluent of the four major leagues. Further it noted that season-ticket sales were more prominent in the NHL than the other three because of the financial ability of the NHL fan to purchase them. According to Reuters in 2010, the largest demographic of NHL fans was highly sought after group males aged 18–34. The NHL estimates that half of its fan base roots for teams in outside markets. Beginning in 2008, the NHL began a shift toward using digital technology to market to fans to capitalize on this. The debut of the Winter Classic, an outdoor regular season NHL game held on New Year's Day 2008, was a major success for the league. The game has since become an annual staple of the NHL schedule. This, along with the transition to a national "Game of the Week" and an annual "Hockey Day in America" regional coverage, all televised on NBC, has helped increase the NHL's regular season television viewership in the United States. These improvements led NBC and the cable channel Versus to sign a ten-year broadcast deal, paying US$200 million per year for both American cable and broadcast rights; the deal will lead to further increases in television coverage on the NBC channels. This television contract has boosted viewership metrics for the NHL. The 2010 Stanley Cup playoffs saw the largest audience in the history of the sport "after a regular season that saw record-breaking business success, propelled in large part by the NHL's strategy of engaging fans through big events and robust digital offerings." This success has resulted in a 66 percent rise in NHL advertising and sponsorship revenue. Merchandise sales were up 22 percent and the number of unique visitors on the NHL.com website were up 17 percent during the playoffs after rising 29 percent in the regular season. ^ While the Montreal Canadiens have won 24 Stanley Cups, this does not equal its number of NHL championships, as the Stanley Cup predates the NHL and was an inter-league championship prior to 1926. The Canadiens won a Stanley Cup championship in 1916 as a member of the National Hockey Association, and 23 as a member of the NHL. Montreal also won the NHL championship twice without winning the Stanley Cup: in 1918–19 when the Spanish flu cancelled the Stanley Cup finals against the Seattle Metropolitans of Pacific Coast Hockey Association and in 1924–25 when they lost in the Stanley Cup finals to the Western Canada Hockey League's Victoria Cougars. ^ As the national rightsholder in Canada, Rogers Media sub-licensed some game broadcasts to CBC and TVA Sports. ^ Beginning with the 2021–22 NHL season, when the new Seattle team joins the Pacific Division, the Arizona Coyotes will move to the Central Division. Coleman, Charles (1966–1969). "Trail of the Stanley Cup, vols. 1–3". National Hockey League. ISBN 0-8403-2941-5. Jenish, D'Arcy (2008). The Montreal Canadiens: 100 Years of Glory. Doubleday Canada. ISBN 978-0-385-66324-3. Holzman, Morey; Nieforth, Joseph (2002). Deceptions and Doublecross: How the NHL Conquered Hockey. Toronto: Dundurn Press. ISBN 1-55002-413-2. McFarlane, Brian (1997). Brian McFarlane's History of Hockey. Champaign, Illinois: Sports Publishing Inc. ISBN 1-57167-145-5. McKinley, Michael (2006). Hockey: A People's History. McClelland & Stewart. ISBN 0-7710-5769-5. "2005–06 NHL Official Rules". National Hockey League. 2005. Archived from the original on September 25, 2005. Retrieved June 10, 2006. Pincus, Arthur (2006). The Official Illustrated NHL History. Reader's Digest. ISBN 0-88850-800-X. Podnieks, Andrew; Szemberg, Szymon (2007). World of hockey: celebrating a century of the IIHF. Fenn Publishing. ISBN 9781551683072. Ross, J. Andrew (2015). Joining the Clubs: The Business of the National Hockey League to 1945. Syracuse University Press. ISBN 978-0-8156-3383-9. Sandor, Steven (2005). The Battle of Alberta: A Century of Hockey's Greatest Rivalry. Heritage House. ISBN 1-894974-01-8. Archived from the original on October 16, 2015. Wong, John Chi-Kit (2005). Lords of the Rinks. University of Toronto Press. ISBN 0-8020-8520-2. ^ Kreiser, John (November 25, 2017). "NHL turns 100 years old". National Hockey League. Retrieved March 29, 2018. Beginning on Nov. 24, 1917, the NHA's directors, George Kendall (better known as George Kennedy) of the Montreal Canadiens, Sam Lichtenhein of the Montreal Wanderers, Tom Gorman of Ottawa, M.J. Quinn of Quebec and NHA secretary-treasurer Frank Calder, held three days of meetings at the Windsor Hotel in Montreal and decided to start over. Gorman, seconded by Kendall, proposed, 'That the Canadiens, Wanderers, Ottawa and Quebec Hockey Clubs unite to comprise the National Hockey League.' The motion was carried, and the NHL was officially formed on Nov. 26, 1917. ^ "Teams". NHL.com. NHL Enterprises, L.P. Retrieved March 9, 2019. ^ Marsh, James (2006). "National Hockey League". The Canadian Encyclopedia. Retrieved June 11, 2006. ^ "NHL.com – Stanley Cup Fun Facts". National Hockey League. Archived from the original on January 17, 2010. Retrieved July 15, 2006. ^ Todd, Jack (September 17, 2012). "Americans and Bettman have stolen Canada's game". Calgary Herald. Retrieved January 31, 2018. ^ Eichelberger, Curtis (May 29, 2009). "NHL Borrows From NFL as It Pursues Bigger TV Contract". Bloomberg L.P. Retrieved June 29, 2009. ^ Podnieks, Andrew (March 25, 2008). "Triple Gold Goalies... not". International Ice Hockey Federation. Retrieved June 17, 2017. ^ "QuantHockey.com". Retrieved November 19, 2012. ^ Jenish, D'Arcy (2013). The NHL : 100 years of on-ice action and boardroom battles. Doubleday Canada. p. 16. ISBN 0385671466. ^ McFarlane, Brian. "Early Leagues and the Birth of the NHL". National Hockey League. Archived from the original on November 30, 2009. Retrieved January 17, 2010. ^ "Victoria Cougars—1924–25 Stanley Cup". Legends of Hockey. Hockey Hall of Fame. Archived from the original on September 30, 2007. Retrieved January 17, 2010. ^ "The History of the Hub of Hockey". Boston Bruins Hockey Club. Archived from the original on May 1, 2008. Retrieved May 16, 2008. ^ Diamond, Dan; Zweig, Eric; Duplacey, James (2003). The Ultimate Prize: The Stanley Cup. Andrews McMeel Publishing. p. 40. ISBN 0-7407-3830-5. ^ "The Legends—Rocket Richard". Hockey Hall of Fame. Archived from the original on March 7, 2008. Retrieved January 18, 2010. ^ "Players—Willie O'Ree". Hockey Hall of Fame. Archived from the original on January 18, 2008. Retrieved January 18, 2010. ^ a b "The Legends—Wayne Gretzky". Hockey Hall of Fame. Archived from the original on November 23, 2005. Retrieved January 18, 2010. ^ "Edmonton's Saddest Hockey Day—The Gretzky Trade". Edmonton Oilers Heritage Foundation. Archived from the original on February 1, 2010. Retrieved January 18, 2010. ^ "Update on NHL expansion application process". National Hockey League. July 21, 2015. Retrieved July 21, 2015. ^ a b Rosen, Dan (June 22, 2016). "Las Vegas awarded NHL franchise". NHL.com. NHL Enterprises, L.P. Retrieved December 5, 2018. ^ a b Rosen, Dan (December 4, 2018). "Seattle NHL expansion approved by Board of Governors". NHL.com. NHL Enterprises, L.P. Retrieved December 5, 2018. ^ a b CBC Sports (January 29, 2004). "We've been here before". Canadian Broadcasting Corporation. Archived from the original on April 9, 2005. Retrieved June 9, 2006. ^ a b c d audohar, Paul D. (December 2005). "The hockey lockout of 2004–05" (PDF). Monthly Labor Review. ^ Molinaro, John (April 20, 2006). "A season to remember". Canadian Broadcasting Corporation. Archived from the original on June 18, 2006. Retrieved June 9, 2006. ^ a b "Super Bowl XLII versus the Economy". Archived from the original on June 3, 2008. ^ "On ice: NHL locks out its players". CBS News. Retrieved September 16, 2012. ^ Strang, Katie (September 16, 2012). "NHL imposes league-wide lockout". ESPNNewYork.com. Retrieved September 16, 2012. ^ "NHL announces cancellation of 2012–13 regular-season schedule through January 14". National Hockey League. Retrieved December 20, 2012. ^ "NHL cancels 2013 Winter Classic". NBC News. Retrieved November 2, 2012. ^ "NHL cancels games through Dec. 14, All-Star game". CBS News. Retrieved November 23, 2012. ^ "NHL Announces Game Cancellations Through Dec. 30". The Sports Network. The Canadian Press. December 10, 2012. Archived from the original on December 11, 2012. Retrieved December 10, 2012. ^ "NHL OWNERS TO VOTE ON CONTRACT WEDNESDAY". Associated Press. Retrieved January 8, 2013. ^ "NHL, players finalize agreement, camps can open Sunday". Detroit Free Press. Retrieved January 13, 2013. ^ Josh Hargreaves (September 5, 2013). "Crosby discusses lengthy recovery road from concussions, safety of the game". The Globe and Mail. Toronto. Retrieved March 14, 2014. ^ "Video: Brendan Shanahan Explains Raffi Torres' 25 Game Suspension « CBS Chicago". Chicago.cbslocal.com. April 21, 2012. Retrieved March 14, 2014. ^ Wyshynski, Greg (September 30, 2013). "NHL players approve hybrid icing, as safety trumps subjectivity | Puck Daddy". Yahoo! Sports. Retrieved March 14, 2014. ^ "Former NHL players sue league over concussions". The Sports Network. November 25, 2013. Archived from the original on January 31, 2014. Retrieved March 14, 2014. ^ "Part 1: Manon Rhéaume shatters hockey's gender barrier". National Hockey League. ^ Bieler, Des. "NHL's first female full-time coach hired by Arizona Coyotes". The Washington Post. Retrieved August 25, 2016. ^ McGran, Kevin (June 6, 2009). "NHL's secret constitution revealed". Toronto Star. Toronto. Retrieved March 12, 2011. ^ Heitner, Darren (June 22, 2016). "The NHL Leads the Way in Bringing Pro Sports to Las Vegas". Inc. Retrieved June 29, 2016. ^ Baker, Geoff (December 3, 2018). "After years of trying and a cast of characters in between, the NHL will finally put a team in Seattle". The Seattle Times. Retrieved December 5, 2018. ^ Cite error: The named reference valuable teams was invoked but never defined (see the help page). ^ Dale, Shane (4 December 2018). "Coyotes will switch divisions when new Seattle NHL team joins league". KNXV. Retrieved 4 December 2018. ^ "Time of match". National Hockey League. 2006. Archived from the original on August 17, 2000. Retrieved December 2, 2006. ^ Fitzpatrick, Jamie. "How the NHL Shootout Works". About.com. Retrieved August 4, 2008. ^ "Oh, what a night ... and morning. Stars-Canucks ranks sixth among longest OT games". Sports Illustrated. April 12, 2007. Archived from the original on November 3, 2007. Retrieved April 26, 2007. ^ Clement, Bill (2008). "Playoff overtime format needs change". NBC Sports. Archived from the original on February 20, 2009. Retrieved May 9, 2008. ^ "Dimensions of Rink". National Hockey League. 2005. Archived from the original on April 9, 2006. Retrieved June 8, 2006. ^ a b "Division of ice surface". National Hockey League. 2005. Archived from the original on June 21, 2009. Retrieved June 8, 2006. ^ "Goal crease". National Hockey League. 2005. Archived from the original on June 6, 2009. Retrieved June 8, 2006. ^ "Rule 63 – Delaying the Game". National Hockey League. 2009. Retrieved March 14, 2010. ^ Diamos, Jason. (September 16, 2005). "New Rule Will Take a Weapon Away from Brodeur". The New York Times (subscription required). Retrieved March 2, 2007. ^ Jones, Tom. (September 18, 2005). "Brodeur not handling new rule well". St. Petersburg Times. Archived from the original on February 6, 2008. Retrieved March 2, 2007. ^ "Brodeur hopes NHL banishes trapezoid". Fire&Ice. 2009. Archived from the original on November 13, 2009. Retrieved November 10, 2009. ^ "NHL decides to keep trapezoid". Fire&Ice. 2009. Retrieved November 10, 2009. ^ Rosen, Dan. "Hybrid Icying tops list of rules changes for 2013–2014 season". National Hockey League. Retrieved December 2, 2013. ^ a b c CBC sports (July 22, 2005). "Relaunching the Game". CBC.com. Archived from the original on May 16, 2006. Retrieved June 10, 2006. ^ a b "Icing". National Hockey League. 2005. Archived from the original on May 14, 2013. Retrieved March 1, 2013. ^ Podnieks & Szemberg 2007, p. 198. ^ "Major penalties". National Hockey League. 2005. Archived from the original on April 23, 2006. Retrieved June 8, 2006. ^ "Ice Hockey Essentials – International vs. NHL". Canadian Broadcasting Corporation. 2006. Archived from the original on February 21, 2006. Retrieved June 26, 2006. ^ a b "Minor penalties". National Hockey League. 2005. Archived from the original on April 23, 2006. Retrieved June 8, 2006. ^ Laurie, Scott (September 28, 2005). "NHL unveils new drug testing policy". CTV. Archived from the original on October 23, 2005. Retrieved January 2, 2007. ^ CBC Sports Online (July 27, 2005). "NHL ramps up rivalries". CBC.com. Archived from the original on September 27, 2013. Retrieved June 6, 2006. ^ "Playoff formats". National Hockey League. 2005. Archived from the original on July 18, 2001. Retrieved June 6, 2006. ^ Fitzpatrick, Jamie (2006). "Stanley Cup Winners". about.com. Retrieved June 26, 2006. ^ "The 10 greatest teams". ESPN. December 31, 1999. Retrieved June 26, 2006. ^ a b "NHL trophies". National Hockey League. Retrieved December 2, 2018. ^ "Naismith Memorial Basketball Hall of Fame Announces Modifications to its Enshrinement Process Beginning with the Class of 2018" (Press release). Naismith Memorial Basketball Hall of Fame. December 19, 2017. Retrieved February 17, 2018. ^ "Roy on deck for 2006, 'mayhem' in 2007". The Sports Network. The Canadian Press. November 7, 2005. Archived from the original on May 16, 2007. Retrieved June 8, 2006. ^ a b "Wayne Gretzky signs five-year contract as head coach". Phoenix Coyotes. May 31, 2006. Archived from the original on June 15, 2006. Retrieved June 9, 2006. ^ a b Wigge, Larry (February 25, 2002). "New world order: as the Olympics have shown, the influx of players from across the Atlantic brought changes to the NHL game". The Sporting News. Archived from the original on April 19, 2006. Retrieved June 11, 2006. ^ Beacon, Bill (June 27, 1999). "Canadians left behind as NHL goes for firepower". The Canadian Press. Archived from the original on June 23, 2007. Retrieved June 11, 2006. ^ PODNIEKS, ANDREW (May 10, 2008). "NHL landscape changes". IIHF. Archived from the original on December 6, 2008. Retrieved May 13, 2008. ^ a b "NHL Totals by Nationality ‑ 2017‑18 Stats". January 12, 2018. ^ "NHL still likes Czechs best". IWHC.net. May 16, 2006. Archived from the original on July 14, 2007. Retrieved June 9, 2006. ^ "NHL Totals by Nationality ‑ 1988‑89 Stats". ^ "2002–2003 – Regular season – Bios – Country". National Hockey League. ^ "2002–2003 – Regular season – Goalie – Bios – Country". National Hockey League. ^ "2006–2007 – Regular season – Bios – Country". National Hockey League. ^ "2006–2007 – Regular season – Goalie – Bios – Country". National Hockey League. ^ "2010–2011 – Regular season – Bios – Country". National Hockey League. ^ "2010–2011 – Regular season – Goalie – Bios – Country". National Hockey League. ^ "NHL.com – NHL Corporate Marketing Partners". National Hockey League. Retrieved January 28, 2017. ^ Richard, Sandomir (November 6, 2010). "Discover Card Forges Tie to the N.H.L." The New York Times. Retrieved January 28, 2017. ^ Perez, A.J. (December 5, 2016). "Dunkin' Donuts announces partnership with the NHL". USA Today. Retrieved January 28, 2017. ^ "HNIC in 2005–06". Canadian Broadcasting Corporation. 2005. Archived from the original on February 10, 2006. Retrieved June 19, 2006. ^ "Hockey Night in Canada: A history of excellence". Canadian Broadcasting Corporation. 2005. Archived from the original on February 10, 2006. Retrieved June 19, 2006. ^ Shoalts, David. "Hockey Night in Canada: How CBC lost it all". The Globe and Mail. Retrieved October 11, 2014. ^ "500-plus NHL games to air under Rogers deal". Sportsnet. February 4, 2014. Retrieved February 5, 2014. ^ "Rogers scores national NHL TV rights for $5.2B". CBC News. Retrieved November 26, 2013. ^ "NHL deal with Rogers a huge blow to TSN and CBC: Mudhar". Toronto Star. November 26, 2013. Retrieved November 26, 2013. ^ "CBC partners with Rogers in landmark NHL rights deal". CBC Sports. Retrieved November 26, 2013. ^ "NHL, TVA Sports launch French-language agreement". National Hockey League. Retrieved September 21, 2014. ^ "NHL signs 12-year TV, Internet deal with Rogers; CBC keeps 'Hockey Night in Canada'". Toronto Star. November 26, 2013. Retrieved November 26, 2013. ^ Faguy, Steve (August 18, 2014). "NHL broadcast schedule 2014–15: Who owns rights to what games". Fagstein. Retrieved August 23, 2014. ^ Weiner, Evan (June 16, 2006). "Don't Believe the Gripe: The NHL Is Back". New York Sun. Retrieved June 19, 2006. ^ Fang, Ken (April 19, 2011). "NBC/Versus To Air NHL Games for the Next Ten Years". Fangsbites.com. Archived from the original on October 18, 2011. Retrieved April 19, 2011. ^ "NHL Centre Ice (Canada) official website". National Hockey League. Retrieved March 14, 2014. ^ "NHL Center Ice United States official website". National Hockey League. Retrieved March 14, 2014. ^ "Fox Sports 1 ". Foxtel.com.au. Retrieved April 9, 2010. ^ "New-look World Cup of hockey back for 2016". Sportsnet.ca. Retrieved January 24, 2015. ^ "Survey: Canadian interest in pro football is on the rise". The Globe and Mail. Toronto. The Canadian Press. June 8, 2006. Archived from the original on February 1, 2010. Retrieved June 8, 2006. ^ a b c Markus, David (August 2004). "Champions of the Turnstiles". gsb.standford.edu. Archived from the original on January 2, 2011. Retrieved June 24, 2011. ^ "Sports: NBA Booming, But Football Is America's Favorite Sport". The Seattle Times. February 21, 1991. Retrieved March 14, 2014. ^ Klayman, Ben (October 8, 2010). "NHL pushes for growth on TV, online". Reuters. Retrieved May 23, 2011. Bass, Alan (2011). The Great Expansion: The Ultimate Risk That Changed the NHL Forever. Iuniverse Inc. ISBN 1-4502-8605-4. Fischler, Stan & Shirley (2003). Who's Who in Hockey. Andrews McMeel Pub. ISBN 0-7407-1904-1. Holzman, Morey; Nieforth, Joseph (2002). Deceptions and doublecross : how the NHL conquered hockey. Dundurn Press. ISBN 1-55002-413-2. Weekes, Don (2005). The Big Book of Hockey Trivia. Greystone Books. ISBN 1-55365-119-7. Wright, Marshall D (2010). The National Hockey League, 1917–1967: A Year-by-Year Statistical History. McFarland & Co. ISBN 978-0-7864-4444-1.